I hope Nevada legislators and their constituents support these important priorities that will ensure Nevadans do not get left behind. The complexity of a new economic era is upon us. In the late 1700s, steam-powered mechanization characterized the first industrial revolution, followed by the use of electric power and mass production. Digitization and information technology heralded the third epoch in the late 1960s and early 1970s. But the speed of innovation leading us into a new and fourth industrial revolution, combining many technologies, will disrupt every major industry in our nation, including production, management and governance systems, according to the World Economic Forum. The importance of associate degrees and industry-recognized certificates in this new economy cannot be understated. To beef up training in this area, Gov. 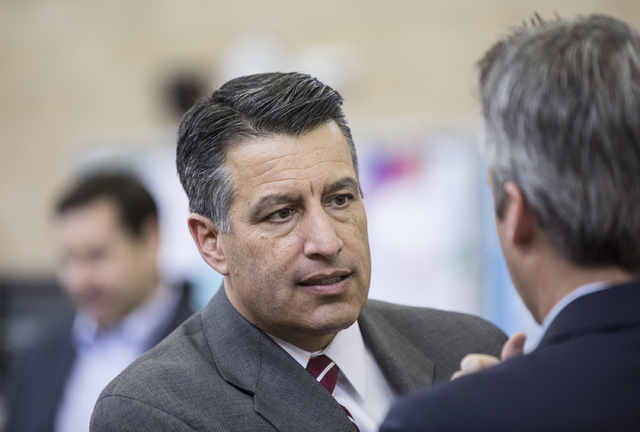 Brian Sandoval dedicated $21 million for community college career and technical education. As engineers make exponential gains in the capabilities of artificial intelligence and digital fabrication, it is community college graduates from high tech fields who will be the technicians to operate these new systems. We see technology displacing workers in many of our staple middle-class jobs, but we have the opportunity to create new positions in new rewarding industries. We can do this through education and the governor’s biennial budget establishes policy priorities that will put Nevadans ahead of these changes. Right now, the situation looks bleak. In Nevada, 31 percent have an associate degree or higher, compared to the national average of 40 percent. We are way behind the educational attainment levels of many states. A devil’s advocate might note that our service-based economy does not require a college education. The service-based economy is our backbone, but it cannot move Nevada forward alone. Nine percent of our workforce earns under $9 an hour and more than a third of Nevada’s workforce makes under $15 an hour or $600 a week, according to a recent state report. We need to enhance our workforce’s knowledge, skills and abilities to grow our own businesses and industries and attract new ones. Implemented after the 2015 legislative session, the pilot Silver State Opportunity Grant, the first need-based financial aid for low-income community and state college students, is an important tool in this effort. The governor has proposed to make this scholarship permanent and double the funding for it. Gov. Sandoval’s vision to use dual enrollment (during which high school students take classes that provide simultaneous high school and college credit) to promote new career pathways is critical to this effort. It can serve as a path to accelerate the number of Nevadans’ poised to work in high-value industries such as health care, IT, advanced manufacturing and teaching. We can also build on his policy to help remediate high school students who are behind in the high school before they get to college and reduce socioeconomic achievement gaps. Gov. Sandoval’s inclusion of capacity enhancements for higher education is particularly innovative and will allow Nevada’s colleges and universities to expand key services. For CSN, this will allow us to grow our new advanced manufacturing and facilities management programs and implement a new college readiness pilot program that will work with underprepared 11th graders to help them catch up and be ready for college-level math, English and reading when they graduate high school. It will also provide key funding to help CSN evolve into a district college in which students have a home campus and local communities have more input into programs and services offered at their respective campuses and centers. Without Gov. Sandoval’s vision, Nevada will lose important ground in our effort to remake our economy and the workforce that supports it. I hope Nevada legislators and their constituents support these important priorities that will ensure Nevadans do not get left behind. Michael D. Richards is the president of the College of Southern Nevada.